The Assumption Association is organising their annual open tournament as the perfect warm-up for the BCC Open. It will take place at the Assumption Association on the weekends of 10-12 and 17-19 March 2017. This is a 9-Round Swiss System FIDE rated tournament open to all players (Open Section) and students (Student Section). No entry fee shall be collected. Student Section: This Section is reserved for students only. Presentation of Student ID is required, or else you will be transferred to the Open Section. Students however may choose to play in the Open if they so prefer. Each player is accorded with a time control of 90 minutes plus 30 seconds per move, starting from move 1. Walkover time is 1 hour after the start of each round. Results will be sent to FIDE for rating calculations. 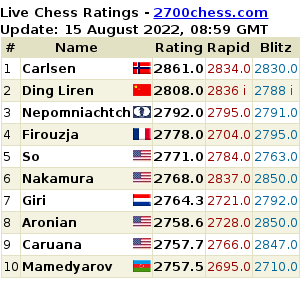 For the Student Section, FIDE rating can be realized only if FIDE regulations on rating are met. Players must record the moves and hand over the score sheets to the Arbiters at the end of each round. In the case of draw, the player with white shall hand deliver the score sheets to the arbiters. The Arbiters may put a result as 0-0 if no score sheet of such a game is not given to the Arbiters. No electronics equipment of any kind is allowed to be brought into the playing area. Violation of this rule shall be subjected to forfeiting the game in that round, even if the device is turned off and found into a bag of the player involved. Players however may deposit their mobile phones/electronics equipment with the Arbiters at their own risks. Any player who misses any round of play without notifying an Arbiter and approved by the Chief Arbiter will not be paired in the following rounds, and may be considered to have withdrawn from the tournament. FIDE (World Chess Federation) rules and regulations shall apply. Players must register to play in advance. Registration is closed on Thursday 9th March 2017 at 12.00 hours. Late registration is accepted on the condition that he/she shall be entitled to play in the following rounds. This means that anyone applying to play on Friday 10th March 2017 shall not be allowed to play on that day, but he/she shall be paired to play in the 2nd rounds onwards, and so forth. Pairing of Round 1 (Friday 10th March 2017) shall be made at 16.00 hours on Thursday 9th March 2017 and will be announced on Bangkok Chess Club Web Site and on the ChessResult.com. Results of each round and pairings for the next rounds shall be made 30 minutes after the last game of each round is completed, and shall also be posted on BCC Web Site and ChessResult.com. For registration, just provide your name (as spelt according to that given to FIDE), your FIDE ID No., and mobile phone/email. In case of dispute, the Chief Arbiter’s decision is final. • Open Section: 1st: Baht 5,000 – 2nd Baht 3,000 – 3rd Baht 1,000, plus trophies. • Student Section: 1st Baht 3,000.00 – 2nd Baht 2,000.00 – 3rd Baht 1,000.00, plus trophies and certificates. Certificate of Participation will be given to students only. All prizes and trophies shall be decided by tie-break. • Number of wins with black. • Play-off: 2 games of 5 min with no increment and if still tied, Armageddon Game of 6 min (white) and 5 min (black), when black wins if the game is drawn. The Organizer reserves the right to adjust the prize money and other prizes as well as other tournament regulations according to the circumstances and suitability with no need to notify the players in advance. The Organizer is The Assumption Association. Dates: Fri 10 – Sat 11 – Sun 12 March, and Fri 17 – Sat 18 – Sun 19 March 2017. Venue: The venue is at Assumption Association, Rama IV Road, Phra Khanong, Bangkok. BTS Phra Khanong Station, and then walk towards Rama IV (Kluay Nam Thai) Road. 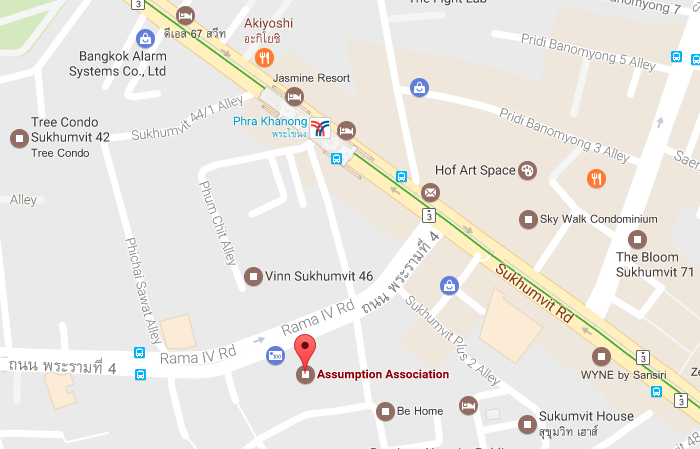 The Association is located on the left side of the road adjacent to Siam Commercial Bank. Enquiries can be made by phone at 085 998 4999, 02 266 5531 [Panupand Vijjuprabha], or 02 390 1062-3 (Assumption Association).